My culinary world is improving dramatically with my new skillet. I love fish. I love shellfish. I love steak. I love pork. And then… there’s chicken. Meh. At least, that is how I usually feel about it. Don’t get me wrong, I truly enjoy some good wings (mmmm Fat Cat), but when it comes to chicken breast or thighs it just never felt very exciting to me. UNTIL NOW. The hubs said last night was the best chicken I had ever made – score! I found this recipe online at Epicurious. Preheat the oven to 475. Season the thighs with salt and pepper and heat the oil in a cast iron skillet over high heat (try not to let the oil smoke, mine was fine). Place the chicken in the skillet skin-side-down. Cook for 2 minutes. Reduce the heat to medium-high and keep cooking skin-side-down. 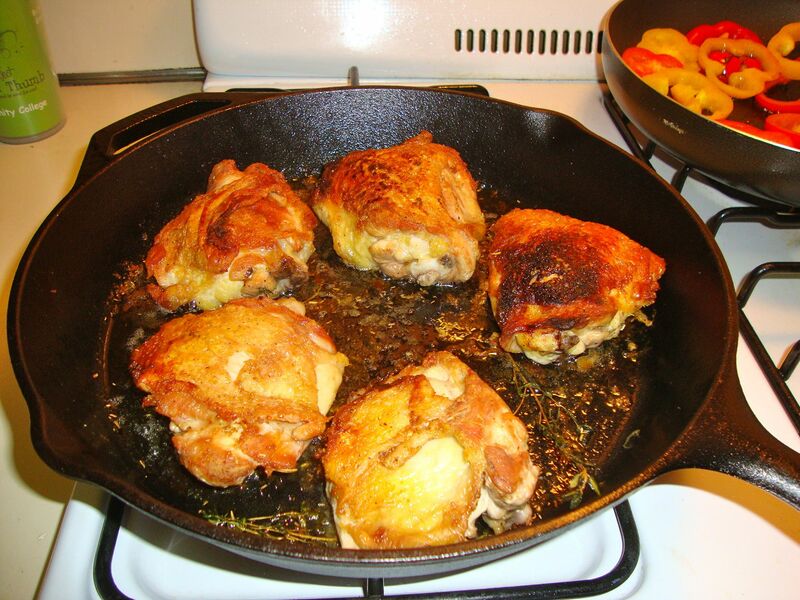 You can occasionally move the chicken a bit to ensure even cooking – but I’m pretty sure with cast-iron you don’t need to worry about whether it cooks evenly since the heat is distributed so perfectly. I just moved mine a little to check on the color and to prevent sticking. Cook for 12 minutes (so 2 mins on high heat, 12 on medium-high). I shook on a little dried rosemary and threw in a sprig of oregano at this point as well. Now move the entire skillet into the oven (keep the chicken skin-side-down still). Cook for 13 minutes. Then flip the chicken and cook another 5 minutes. Remove from the oven and let the chicken sit another 5 minutes before you serve. This is always a hard step because you want to eat, but the chicken will be so much more moist if you allow it to sit. We had two leftover thighs so I made ratatouille tonight to go with it. Delish.